In the world of IT, nothing sounds as consistent as the word ‘Change’. Customer demands are constantly changing and organizations are searching for means to become more competitive and keep pace with the market graph. The only way to respond to this change is finding a simple way to improve software throughput – by leveraging products with timely software updates, adding new features, tweaking existing ones, and responding to customer feedbacks instantly. DevOps responds to the change by iteratively improving on the production process through automation of tasks and orchestration of the various stages involved in the software development and management of its lifecycle. However, even software deployment grinds to a halt if teams do not establish a strategy to deploy patches or new requirements without disrupting the workflow or application stability. Time to change your DevOps strategy! DevOps is a methodology that encourages teams to collaborate and to meet business goals. However, by nature teams only focus on those parts that they possess expertise in and not on software production as a whole. Naturally, accepting responsibility of the end business result seems frightening, especially when you are accustomed to only accepting assigned tasks. It takes a lot of trust among team members and the management. Fitting the methodology within an organizational structure, requires being aware of the business goals and values that are important for deciding how a software production process should flow. A sight that will help teams to get a clear idea of the business values, purpose, truly feel like being a part of the team and find motivation to contribute to the vision of the organization as one. It ultimately leads to better management style, where requirements are broken into chunks and then redirected to teams based on business priorities, all the while ensuring that the Work in Progress is under proper monitoring and control. All these are done while keeping the business context in mind. However, business priorities can only be drawn when you have a proper structure and guidance to help you get accurate information without referring to technical requirements or release notes. What needs to be continuously improved? Deciding on the three ‘What’s’ helps to reduce friction and ensures continuous stability throughout the system, while at the same time helping businesses to keep their goals aligned with market demands. Kanban enables developers and testers to work as a team and finish what they started. This collaborative approach requires teams to divide the board into columns to represent the several phases of production. You can define each column based on the nature of work and the teams. Besides, a column can be subdivided into two lanes to represent ‘Work in Progress’ and ‘Work Done’. Kovair Kanban board is tailored to suit every business requirement. A Kanban column is incomplete without Kanban cards, using which tasks are assigned at each phase based on business requirement. 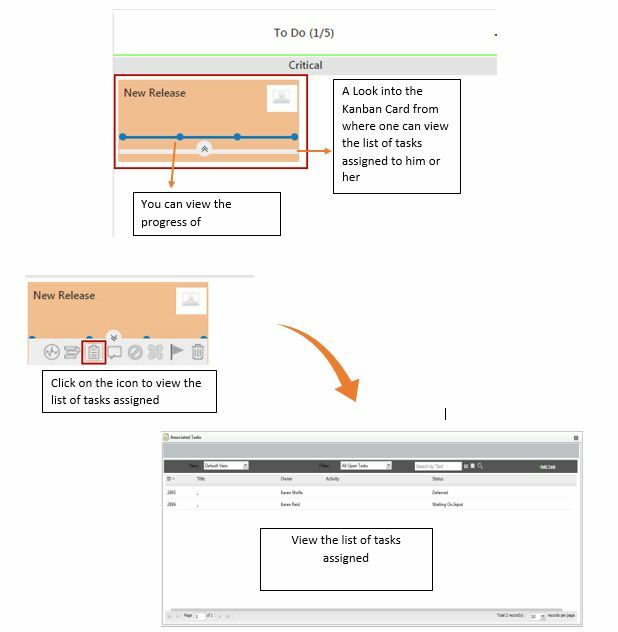 One can view the corresponding tasks assigned by simply clicking on the white panel slider running across, at the bottom of the Kanban card. Kanban cards can play a very important role across the different stages of a software production. Apart from showing the list of tasks corresponding to a particular card or the task in progress, you can also track work across the different stages of a software development. All that a project manager has to do is follow the movement of the Kanban card. Therefore, once an assigned task is complete in one phase, the card is ready to proceed over to the next phase or column. When the card moves from one column to the next, whoever is in charge of a particular column can pull another card (containing the next set of assigned tasks) from the backlog and begin working on it right away. This helps to save time and enable seamless automation and orchestration in the process. Kanban enables teams to break down requirements into small chunks based on priorities. This helps to facilitate incremental product release. 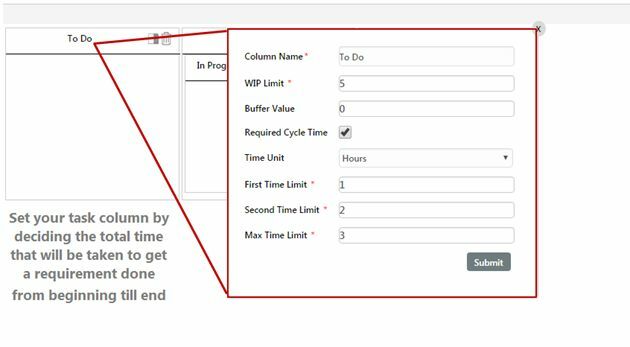 This way, engineering teams do not have any time constraint conflicts and can work on individual units of a software at a given time period only. The presumptive goal of a DevOps initiative is to move fast, deploy rapidly, and to respond quickly to changing business needs. When observing business requirements from this perspective, it becomes very apparent as to how Kanban can help us become progressive and achieve business agility. Using the project management feature, businesses can check project status and progress on a daily basis. Information related to work gets communicated visually and the idea sounds appealing and transformational when we compare this to a typical standup meeting for a two to three week sprint. The beauty of this system is that it helps you to identify bottlenecks in the process even before they arise. As a result, your DevOps strategy is streamlined along a proper path to delivery without compromising quality. Both Kanban and DevOps focus on a different set of objectives. 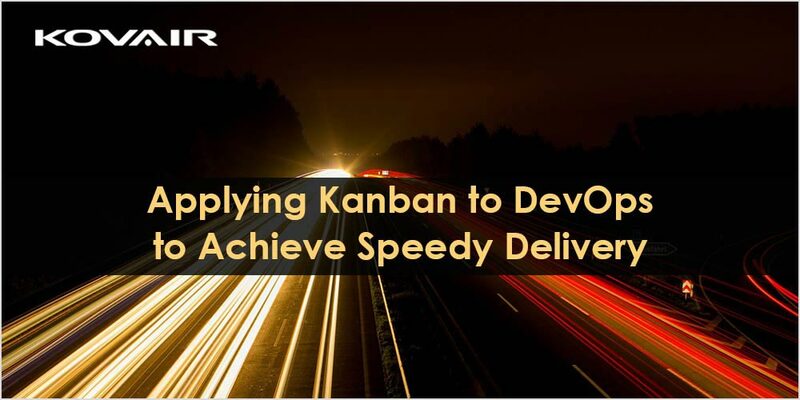 While Kanban is more concerned in delivering productivity with efficiency, DevOps aims to achieve continuous delivery with high quality. Embracing both the approaches can help you ensure continuous delivery of services without breaching the stable environment. In short – Delivering quality and speed. Riya Ghosh is Technical and Web Marketing Writer at Kovair Software. She takes keen interest in areas related to ALM, DevOps, Search Engine Optimization, Web Design, Video Communication and conceptualization. When she is not writing, you will find her busy clicking pictures of whatever grabs her interest. Previous Post:Adapters vs. Plug-ins in Software Development: What Separates Them? Very Impressive DevOps tutorial. The content seems to be pretty exhaustive and excellent and will definitely help in learning DevOps course. I’m also a learner taken up DevOps training and I think your content has cleared some concepts of mine. Thank you Neena! Glad we could help you.